Yoshinaga: "We're standing at a major turning point for Subaru. It shouldn't just be about volumes. We should be making cars only Subaru can make that are a little more expensive and more profitable than the competition." TOKYO (Bloomberg) -- What car company's stock has risen the most -- fivefold -- since the beginning of 2012? Besides Tesla Motors Inc. It's Fuji Heavy Industries Ltd., maker of Subaru. Profits and sales are heading toward records after the company benefited more than most Japanese carmakers from the weakening of the yen and as new models such as the BRZ sports car have become so popular that U.S. consumers need to wait months to get one. The success is leading President Yasuyuki Yoshinaga to worry whether the niche maker of all-wheel-drive vehicles is getting too big. "We're standing at a major turning point for Subaru," Yoshinaga said in an interview this week in Tokyo. "It shouldn't just be about volumes. We should be making cars only Subaru can make that are a little more expensive and more profitable than the competition." Debates are raging internally whether to expand Subaru's lineup of cars, make a push for cheaper vehicles for markets such as India or stick to the products the company sells well, Yoshinaga said. Executives at the company, which counts Toyota Motor Corp. as its biggest shareholder, will begin discussions this month through next year to determine the long-term direction of the Tokyo-based company, he said. "Some people in the company may want to make mass-market products or cheaper cars, but is this really the right direction for Subaru?" Yoshinaga, 59, said. "We're not a carmaker that can grow as big as Toyota. And even if we could, reaching that sort of scale would mean we'd stop being Subaru." Takaki Nakanishi, founder of Nakanishi Research Institute Co. and Japan's top-ranked auto analyst this year by Institutional Investor magazine, said Subaru is better off small. 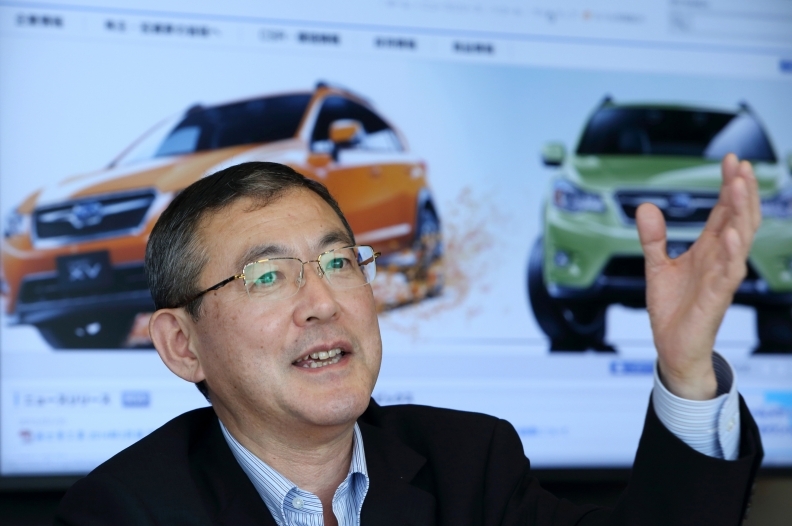 "Subaru is a niche product," Nakanishi said. "They have a strong partner in Toyota, which is complementing Subaru's product development so that they can focus their strategy on being a niche player." While the company has a midterm target of reaching 850,000 units by March 2016 and estimates deliveries will reach 1 million by the end of the decade, Subaru may be speeding ahead of schedule. Sales climbed 13 percent to 724,000 units in the year ended March and may rise to 752,000 this fiscal year, according to the company's latest forecasts. Subaru has a midterm sales target of reaching 850,000 units by March 2016 and estimates deliveries will reach 1 million by the end of the decade. 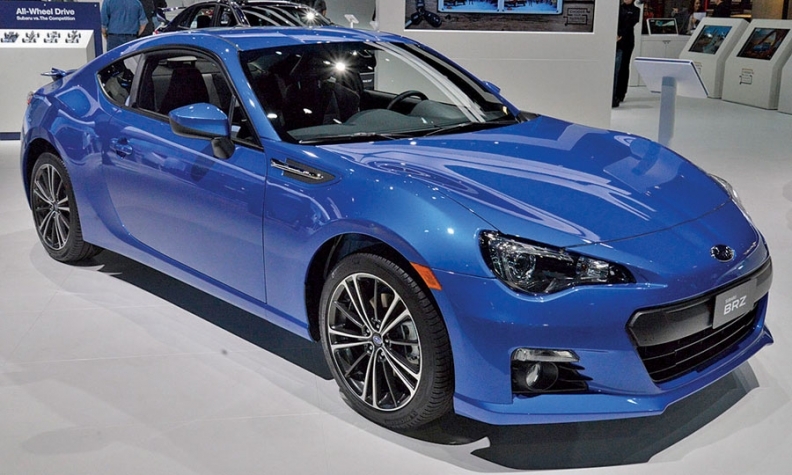 Among those sales is the BRZ, jointly developed with Toyota, which was so popular it once had an eight-month waiting list in the United States. Sales of Impreza sedans more than doubled in 2012 after the company introduced a remodeled version in 2011. The new Forester SUV introduced last year earned the highest safety evaluation by the U.S. Insurance Institute for Highway Safety this year, making Subaru the only carmaker with a Top Safety Pick winner in its lineup for four consecutive years, the company said. With Subaru on such a roll, discussions that could put a brake on expansion would risk the company missing out on record demand. Debates about preserving Subaru's niche status also come as the weakening yen makes it more favorable for manufacturers to expand production in Japan. Yoshinaga said producing as many as 1 million units would be an "appropriate level" for Subaru. Still, the company isn't halting expansion. Subaru is investing $400 million to expand output at its Lafayette, Ind., factory by 100,000 units by the end of 2016 as demand rises for its vehicles. For now, the company's enjoying its salad days. Profit almost tripled to a record 48.5 billion yen ($500 million) last quarter and its 12.7 percent operating margin was second only to China's Great Wall Motor Co., according to data compiled by Bloomberg. Analysts estimate the company will finish the fiscal year ending March earning more than Suzuki Motor Corp., which sells more than twice as many vehicles as Fuji Heavy. Part of its recent success can be attributed to luck. The company's failure to win Chinese approval to build cars in the country became a blessing last year, after a territorial dispute over a group of uninhabited islands fueled a wave of anti-Japan protests across China. Fuji Heavy was largely immune to the backlash that led Toyota, Nissan Motor Co. and Honda Motor Co. to report drops in China sales in 2012. Then there's the yen, which has weakened against every major currency in the past year, including 19 percent versus the dollar. U.S. sales of the BRZ sport coupe total 4,774 this year through July, helping push Subaru's volume up 27 percent to 240,591 units. Fuji Heavy made three-quarters of its vehicles at home and sold 80 percent of them overseas last quarter -- mainly the U.S. -- which is why it benefits from a weaker yen more than all Japanese carmakers except for Mazda Motor Corp. Though the yen has allowed some Japanese carmakers to sweeten car deals -- Nissan cut prices of seven models in the U.S. -- Yoshinaga said Subaru will resist following suit. Subaru offers the lowest incentives among automakers tracked by researcher Autodata Corp. Competitors are complaining. Ford Motor Co. CEO Alan Mulally in June called Japan a currency manipulator that's giving local exporters an unfair edge. John Krafcik, chief executive officer of Hyundai Motor Co.'s U.S. unit, said the discounting by Nissan has put the rest of the industry on watch. "We haven't raised incentives at all," Yoshinaga said. "We are not aiming at taking market share. I hate that Japanese cars are seen as a group and being attacked altogether. I hope there won't be such unfair criticism."